Hey guys! It's been a few weeks since I brought you an indie spotlight, but today I have a great one for you! The maker is All That Glitters. I have several polishes to share so I am just going to get right to it. Valentine Massacre is a really cool Jelly based polish with glitters of different sizes throughout. I love the vampy look of this color, and I love the name. I layered 2 coats of it over a plain dark red jelly. 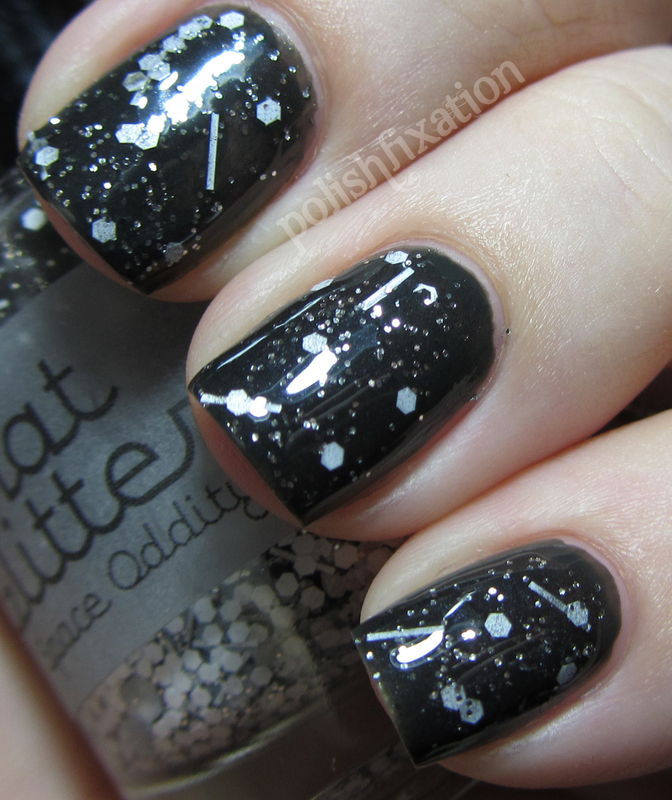 Space Oddity is an amazing glitter mix in a light grey jelly. 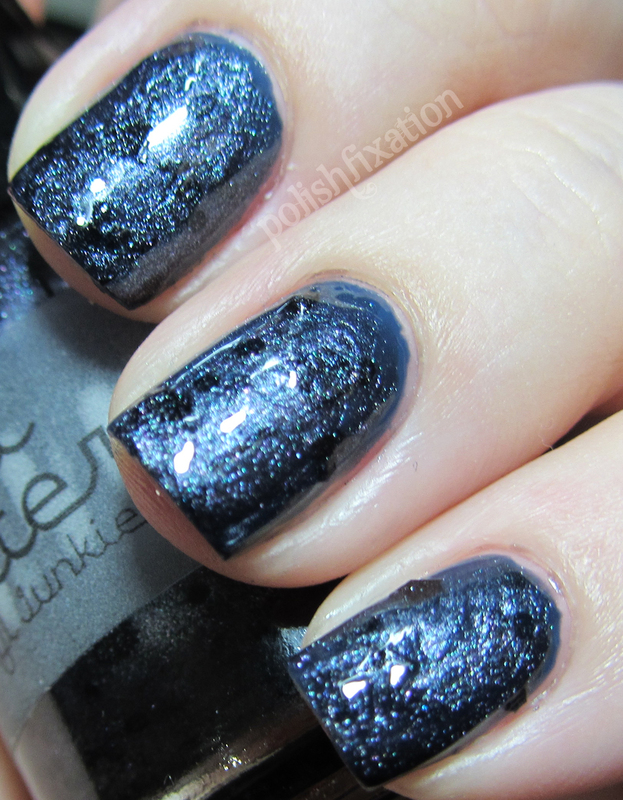 I LOVE how this looks over the charcoal grey polish I used as "underwear". Gorgeous! Vinyl Junkie is a sheer-ish pearly grey base with different sizes and shapes of black glitter throughout. I layered it over a slate blue and I like the look of it, though honestly it isn't my favorite of the bunch. I am not a huge fan of pearly type finishes, so that might be why. The application and wear on this was great though, so if you like pearly shimmers, this might be just the polish for you! Cha Cha Twist is the last polish I have to review for today. This is definitely my favorite of the group! 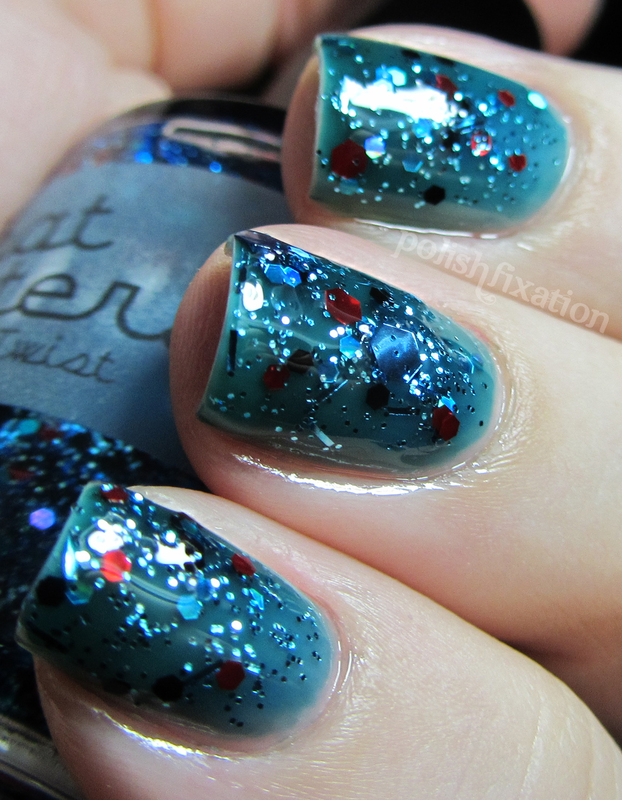 This is a pale blue jelly base with aqua, blue, black and red glitters in various colors, shapes and sizes. I layered it over a light blue plain jelly and I think it is absolutely gorgeous! 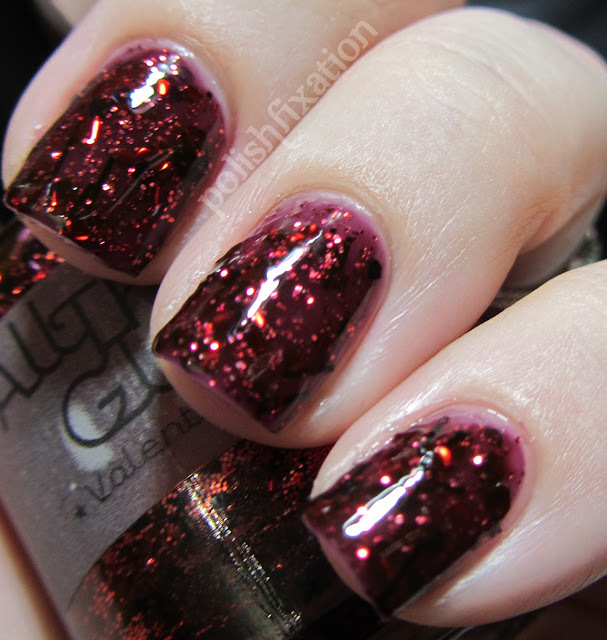 The glitters lay flat and top coat leaves it with a smooth and shiny finish. Love! Overall I really liked these glitters from All That Glitters. I can't wait to see what else this shop comes out with in the future! She said on her Facebook page that the opening has been moved back to Friday, August 3rd at 5pm PST because she's sick. Thanks for the info, I just checked it out myself and edited the post accordingly!